Hey! Today is my Rezday. I’m 2. *grin* Happy Rez day to me! The ducks and I celebrated by hanging out in the water together. *smile* We don’t always see things the same way, but we are family. The last Sunday of each month is Calli’s revival breakfast. I had to miss the first and my did I repent. 😦 I made the second and Glory BE!!! I floated on out to my day on a cloud of well-being. 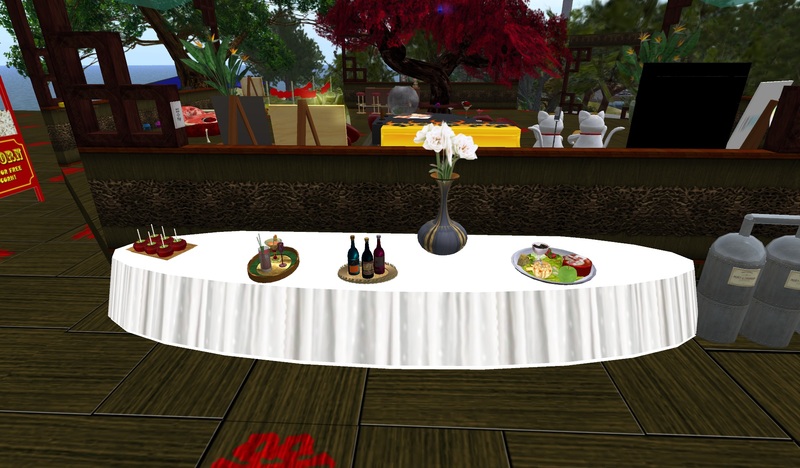 Not only did Calli dish up the tunes, but there was quite a repast as well. Of course there is also the requisite revival tent. So come on down this Sunday to Meatspace Lounge and let the music save your mortal soul! You may even get a halo! Fricker Fraker gave us all a gift this evening – his summer solstice concert. Yes, the solstice was actually yesterday, but so what. Stop being so picky. If Fricker is playing, I don’t care WHAT day he claims it is. *grin* Fricker’s music is wonderful. 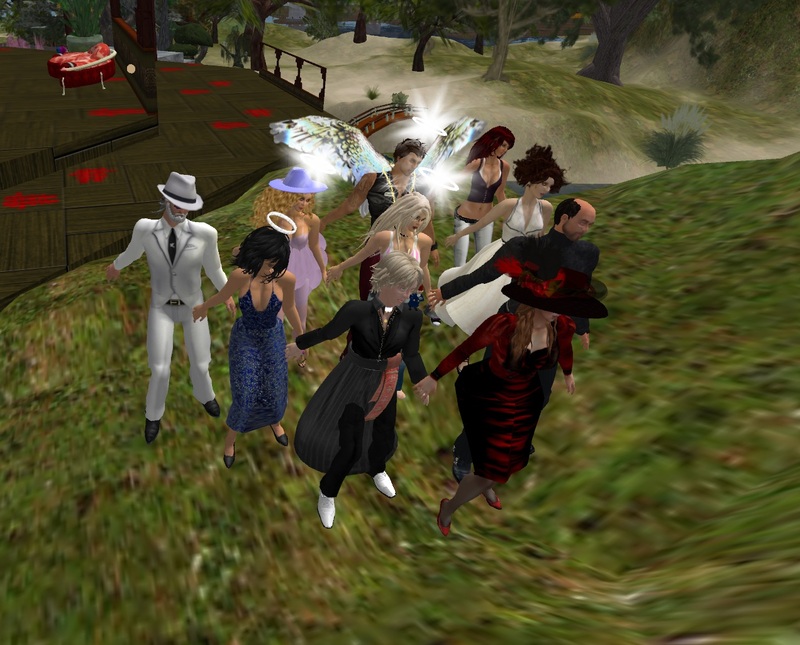 We all gathered at Edloe, thanks to Crap Mariner, who was hosting us all. 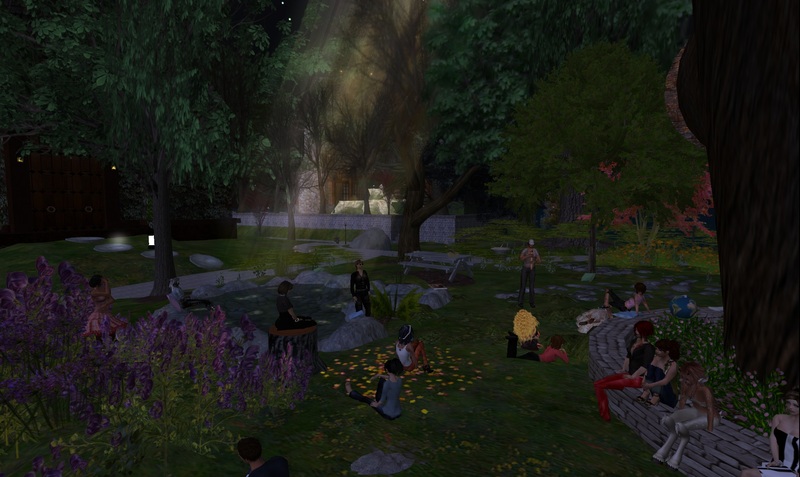 I sat down on the grass, sipped my wine, and lost myself in Fricker’s flute playing. I felt all my tension and stress slip away. Vanished. It was so relaxing. So peaceful. So soothing. Balm for the soul. The only discordant note is that the summer solstice has come and gone. That means the days will be getting shorter. NO! Fricker is playing, and so all unhappiness is banished. We have the whole summer stretching before us. Ahhhhhh……. Thank you Fricker. Thank you Crap. The photos here are mine. Panacea Luminos took a photo of me that I think is simply lovely. Thank you Panacea! You are a wonderful photographer! Here are the photos that she posted. I am fed up. I have had it. I was raised with the expression “If you don’t have anything nice to say, don’t say anything”. That does not mean I am opposed to criticism. Or to suggestions. Or to editing, corrections, opinions, or comments. BUT……. You don’t like SL? Fine. You can prefer using phone conferencing. You can prefer Facebook. You can prefer face-to-face (and I so hope YOUR company allows travel). Go for it. Do what works for you and makes you happy. But ENOUGH with the negative remarks. You can prefer Facebook without sneering about bobbing avatar heads. Or whatever. You can state your reasons for disliking SL or Opensim or any virtual 3D world WITHOUT having to be nasty, patronizing and rude. All you do is show YOUR inability to make a reasoned, well thought-out, articulate comment. I’m blogging here because for the last several days at work I have read nasty, patronizing, derogatory remarks about avatars. You know what? Facebook does not work for me. Yes, I have an account, yes, I check it out daily. I rarely post or use it. BUT – I feel no compulsion to insult everyone who loves it, uses it, lives there. Hey – it works for them. That is a good thing. 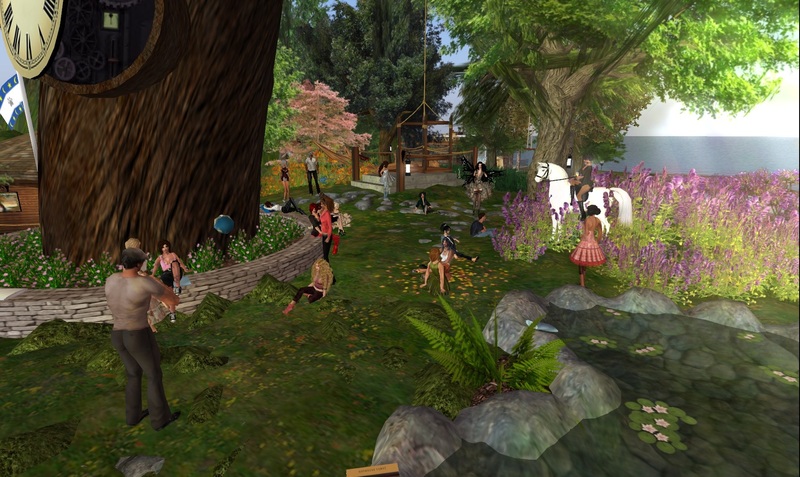 I love SL, opensim, 3D worlds. THAT works for me. 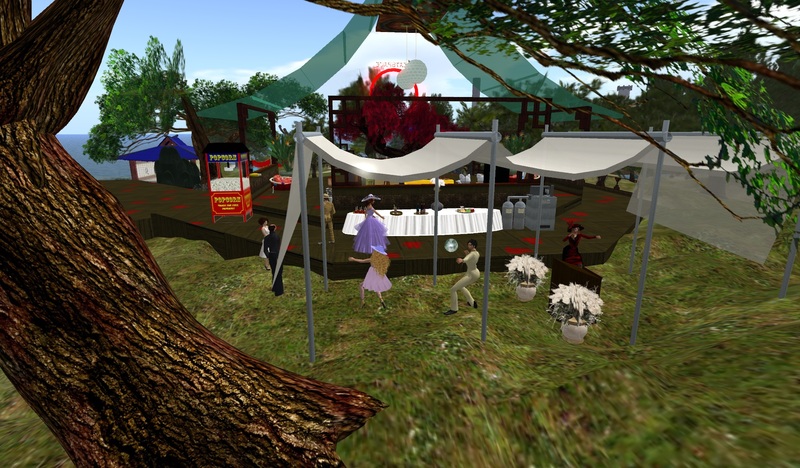 I love the interaction of avatars, voice, creating, music. I find the avatar experience much more immersive and productive than Facebook or video conferencing. I find that using an avatar feels to me as if I have a physical presence at the meeting. For me, I find that avatar placement and movement conveys meaning and intent. See? I didn’t need to insult anyone at all. Just stated my opinion and preference. I could go on, stating calmly the interfaces that work and do not work for me. No insults. No sneering. No foaming at the mouth. This goes for group chat in SL too, by the way. Screaming mindlessly at a lone Linden for ALL of LL’s policies for the last 3 years is neither productive nor civil. If you wish to point out all the ways LL’s policies have disappointed or harmed you, you can do that without calling the individual a liar, close-minded, an enemy, willfully destructive and more. Allow the person a chance to actually speak. Remember that undoubtedly the terms of employment force an employee to temper responses. Sheesh. You were like a bunch of rabid dogs. Disgusting. You think you are professional? You think you are smart? You think you know so much? Act it. Demonstrate some veneer of civility. I hate shopping. I resist the lure. But every now and then I go on a MM board craze, tp’ing around and slapping the boards. I usually end up with all sorts of items that I don’t really need and often never even unbox. I rarely end up buying anything else, because I usually tp in and out. Last night the tp for a cuddle basket MM board came up. It was at 8/25. I was not doing anything other than chatting, so it was easy enough to head over. I was chatting with Chestnut, so I tp’d her to join me to slap the board. While I waited for her to rez, I looked about the store and realized there were lots of interesting items. What caught my eye was the pile of pillows. So I tossed myself onto them. What a great animation! The pillows have couple, single and friend poses. You can change the fabric. Chestnut and I went through all the poses. I loved it. And so….. of course…. I bought it. Ah, the beauty of shopping in Lindens…. Go buy yourself some pillows and have fun!